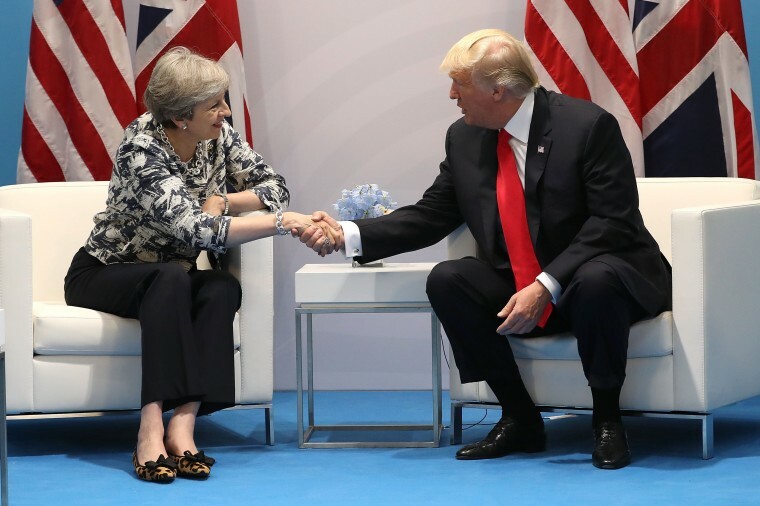 President Donald Trump promised a “very big” and “powerful” trade deal with the United Kingdom Saturday, as he met with British Prime Minister Theresa May on the sidelines of the G-20 in Hamburg. The president also confirmed he would visit the U.K., despite the threat of widespread protests. Trump said he hoped the U.S. and U.K. could quickly establish a bilateral trade deal as Britain prepares to leave the European Union. "We're working on a trade deal which will be a very, very big deal, a very powerful deal, great for both countries," Trump told reporters as he met with May. "I think we'll have that done very, very quickly," he said. The U.K. cannot establish a separate trade deal with the U.S. until it has left the European Union in 2019. The president also confirmed he would be going to London but did not give a time frame for the visit. Trump’s announcement follows local speculation that the president might have visited his Scottish golf course on his way to or from the G-20 summit this week, to avoid an official state visit which might spark protests. The rumors swirled after The Guardian reported that the president told May he did not want to go ahead with the state visit if it would lead to demonstrations. Last month London's Mayor Sadiq Khan said Trump's state visit to Britain should be cancelled after Trump criticized him following the London Bridge attack. Khan said Trump was "wrong" about "many things" and should not be welcomed to the United Kingdom.